I-5 Underpass. 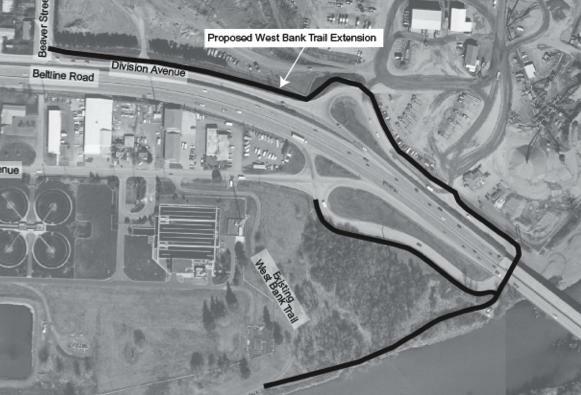 As part of its $180-million I-5 bridge widening project, ODOT has included this $1.5 million project to connect the riverfront bike trail through the freeway mess. Springfield Middle Fork Path. An MPC amendment last month “slips construction to 2010” of the first phase of this $6 million project. Oddly, Willamalane has planned the first $3 million phase as the easternmost portion (see red line on map below). Funding for the second phase (pink line) connecting the path to Dorris Ranch remains unclear. Also unclear is funding for a possible bike bridge across the river to the Mt. Pisgah park area. Biking from Eugene all the way to Mt. Pisgah on scenic and quiet off-road trails along the river has long been a dream of local cyclists.